If you’ve been keeping an eye on marketing trends in the past few years, you might have heard of experiential marketing. Let’s take a look at the benefits, check out a big-brand example, and explore how you can make it work for you. Marketing aims to build up a relationship between a product or brand and its potential customers. Relationships thrive on shared experiences – things that make an impression, form a bond and get remembered. That’s the whole ethos behind experiential marketing. It’s a three-dimensional, real-life way to make your stamp on your audience; drawing them in with all five of their senses, to share something unique and memorable. As attention-grabbing tactics go, it definitely beats old-school poster campaigns and TV ads (although nobody’s saying these have had their day). The great thing about experiential marketing is that it can be adapted to fit your brand values. If yours is a playful, good-time brand that’s all about having fun, you might think about setting up a pop-up theme park or roller disco. At the more refined end of the market, you could organise a tasting experience, inviting people to sample delicious foods and drinks in a suitably classy venue. From these examples, you can imagine just how much of an impact these experiences might have on your target audience, and how they would be primed to associate your brand with the sensory memories they would have of your event. Innocent Drinks wanted to build up awareness of their brand as the ultimate thirst-quenching choice, perfect for a summer’s day. Their solution? The World’s Biggest Sprinkler – a world record-breaking water sprinkler system that was installed by Entertainment Effects in a London park on a baking hot summer Sunday. 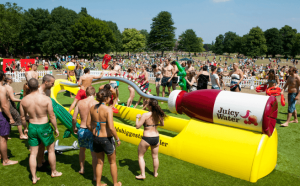 It ticked all the boxes, drawing media and crowd attention with a larger-than-life spectacle, as well as offering a genuinely useful, fun and desirable way to cool down in the heat. Combined with free samples of their Juicy Water, the event was a textbook example of experiential marketing in practice. Stay in character. Make sure you understand your brand personality through and through – and make your experiential marketing an extension of this. Get it wrong, and people will come away with the wrong impression of what you stand for. Join up with traditional marketing channels. Remember how we said that posters and TV ads still have their place? Experiential marketing should never seek to replace these traditional forms of marketing; instead, it should slot in and reinforce the messages they send. You can also use footage of your campaign in social media publicity. Bring in the experts. At Entertainment Effects, we’re used to setting up attention-grabbing stunts and effects for PR and promotions. We were the brains behind Innocent’s water sprinkler, and we also build custom-made features and effects for all types of PR and product activation events. Find out what we can do for you: contact us on 01707 269 566.